Mari with her hair down? Yes please. If it was Mari's mother, that'd be consistent with both the 'new character' and appearance, plus she could be put into a flashback and not interfere with any of the existing storyline. I don't think that would make sense unless the theorized time loop has the Mangaverse as one of it's repeats. Geez, who could it be. It can't be Mari, Mari wears glasses. Isn't it odd that that woman who doesn't wear glasses isn't ever in the same room with Mari? This new promotional flyer with mystery girls has both: "©カラー　©カラー・GAINAX"
Please unleash all the ridiculous speculation. EDIT: ChaddyManPrime, she might not be wearing the glasses but she's holding them. To me that just looks like Manga!Yui holding Gendo's glasses. 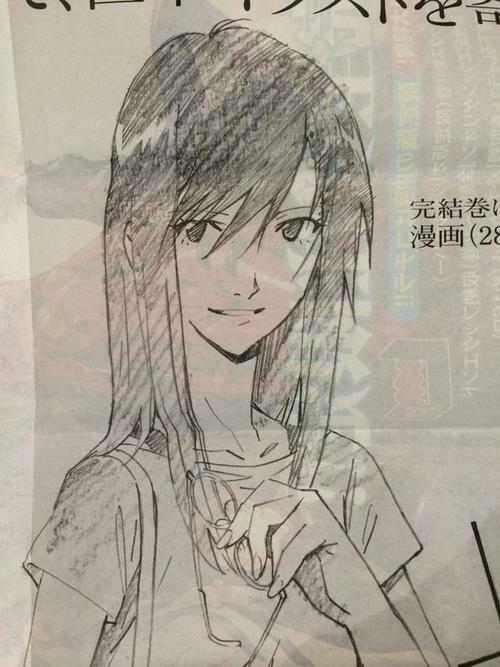 Ya it looks a lot like Mari, and she looks great with hair down! She reminds me of when Asuka had her hair down in that bathroom scene. Oh, Goodness that's Mari! No doubt about it! "The power of the Evangelion is the power of love"
I think this makes Three or Four Eva Universes she's appeared in so far. Three universes: NTE, ANIMA and now the manga, if it's actually Mari, but it looks so much like her that I can't think that it's a completely original character. It wouldn't be Eva without finding a new way to sell it to the fans. I'd have a real big laugh if the "New Character" just turns out to be a Barista. In the new 28 pages Asuka & Shinji go to a coffee shop & the "New Character" serves them both a cup of coffee. End of story. Let the fan fiction begin! The fourth is the Petite Universe if you count it, I was kinda hesitant to do so. IIRC, she only appears very briefly in the videogame of the Petite Eva series, which is her very first appearance past the 2.0 trailer and also where her name was revealed. She also shows up in some art so I count it, just hesitant to use it. I think the 28 is the mystery woman's age. Need a bigger scan to see for sure. Edit: Looks like the 28 = 28 pages after all.